In Traditional Chinese medicine, Corydalis is believed to invigorate the blood and stimulate the movement of qi throughout the body. It has been used for menstrual pain, as well as abdominal pain, nerve pain, and back pain. Corydalis, or Yan Hu Suo, has been studied for other medical conditions as well that include pain that is caused by intense cold, irregular heart rhythm, chest pain, and bacterial infections. It is considered to be especially useful for fighting stomach ulcers. Its medicinal properties lie in the roots and rhizomes. Corydalis root tincture is used for its analgesic, antiseptic, antispasmodic, sedative, tranquilizing, hypotensive and as a cardiotonic. It contains more than 20 potent alkaloids that include dehydrocorydalmine, protopine, cordylines, and tetrahydropalmatine. And though it is similar to the effects of opium poppy, Corydalis is non-addictive. The herbal extract of Corydalis has been used by herbalists for nervous system disorders, such as Parkinson's disease, and is also believed to be helpful for anxiety, restlessness, edginess, and sleeplessness. Corydalis herbal liquid is typically mixed with other herbs, by Chinese herbal practitioners, for example, Peony and Licorice, to fight spastic pain. American herbalists have used Corydalis Root tincture with California Poppy tincture to treat nervousness, insomnia, anxiety, and agitation. The high alkaloid content makes Corydalis an effective remedy, when properly used, for palsy, trembling hands, and over-excitement. One of the alkaloids contained in the herb works on the nervous system and has been used as an ingredient in medications for Parkinson's disease. It has also been useful for Meniere's disease, a sudden attack, with dizziness, nausea, vomiting, a ringing in the ears, etc. Its sedative properties have been used to treat a wide range of conditions including distress and irritation, as well as restless leg syndrome (RLS). As a hypnotic, an agent that promotes or produces sleep without disturbing alertness and perceptiveness, this herb may be very helpful for those with insomnia. The alkaloids are tranquilizing and may increase the sleep-inducing effects of barbiturates. It has been found to be about 40 percent as effective as morphine for inducing sleep. Considered to be an effective pain reliever, Corydalis liquid extract has been used to ease chest caused by clogged arteries, called angina, and abdominal pains, as well as back pain. Herbalists believe it to be beneficial in decreasing the pain caused by intense cold, pain during periods, headache pain, hernia pain, gallbladder pain and the pain caused by traumatic injuries. The herb is traditionally used as an analgesic, and it diminishes the pain without causing loss of consciousness. The Chinese Poppy plant, though non-addictive, has a powerful effect that can last as long as two hours, and those who have used the herbal supplement have not been shown to create a tolerance to the medicinal plant. 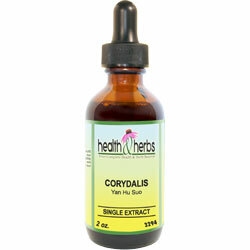 Various types of Corydalis have been included in traditional Chinese medicine (TCM) for gastritis-like disorders. It is also thought to be quite effective in the treatment of bacterial infections, especially from Helicobacter pylori in the stomach or ulcers. Early studies have shown that certain compounds found in Corydalis may help in the treatment of infections caused by the parasite Echinococcus granulosus caused by the Hydatid worm. More studies are being done in this area of treatment. The herb has also been used for increasing appetite and to promote digestion. As a blood stimulant, it helps to quicken the functional activity of soft tissue, giving more energy. Corydalis root extracts have been looked at for diabetes and may help to slow the formation of cataracts associated with the disease. Ingredients: Corydalis Root (Tuber), Structured Water, 20% Alcohol. Non-Alcohol: Corydalis Root, Structured Water, Vegetable Glycerin. Contraindications: Corydalis may interact with certain medications, including sedatives, hypnotics, some pain relievers, anti-cancer drugs and drugs for irregular heart rhythms. The American Herbal Products Association has assigned Corydalis a class 2B rating, meaning that it should not be taken by pregnant or nursing women. Alcoholic drinks may interact with Corydalis herb. Corydalis should be used under the supervision of a healthcare provider. The extract is not for use of children or nursing women, and those with liver or kidney disease. People taking sleeping pills or depressants should avoid it, the effects have not yet been fully established. Corydalis has not undergone any meaningful safety testing. The herb is known to produce immediate side effects, including nausea and fatigue, in some people. From Jonal Rosales of miramar, Florida on 7/30/2016 . From Holly Tetreault of Brockton, Massachusetts on 1/3/2015 . From Anonymous of Buena Vista, Colorado on 9/20/2014 . From Anonymous of new cumberland, West Virginia on 8/25/2014 . From Anonymous of Noblesville, Indiana on 6/13/2014 .